It was a bit of a grey and dreary November day outside, but at York Racecourse this weekend it was Christmas. 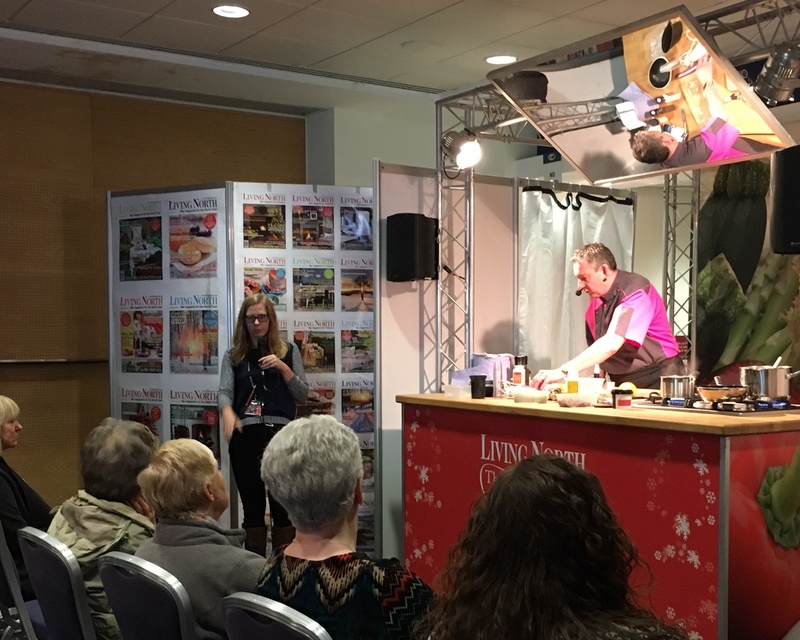 The Living North Christmas Fair was thronging with a good natured crowd celebrating the beginning of the festive season with some top artisan producers, designers and retailers from around the region and beyond. 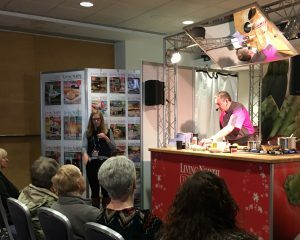 The demonstration area was packed with an enthusiastic crowd keen to learn some of the tricks of the fine dining trade and enjoy the seasonal aromas generated by the toasted gingerbread (generally agreed to take croutons to a whole new level) and grated orange zest. Yves took the audience through the recipe step by step. His top tip of the day was to grease some cling film, add your egg and drop the wrapped parcel directly into hot water – voila a perfectly poached egg with no mess! Cut a square of cling film – 30x30cm – oil it and break an egg into the centre of it. Fold the cling film on top of the egg and tie it to secure. Cook for 4 mins in boiling water then remove and put the egg in water with ice cubes and let it cool down. In a pan, cook the mushrooms with 25g butter then drain them and add salt and pepper. Peelll the shallot and the garlic slice into small pieces then fry in a saucepan with the remaining butter and two tbsp of olive oil. Add the chestnuts and deglaze with the white wine. Let the mixture simmer until it has reduced by ¾ , add the chicken stock and let it reduce to half its volume. . Add the cream and blend. Add salt if necessary and add pepper. Dice the ginger bread and bake it in the oven for 20 mins at 180°c. To serve – heat the eggs for 30 seconds in a microwave. Place the velouté in a soup bowl then remove the egg from the cling and place it in the middle of the velouté. Add the mushrooms on top with the ginger bread. Sprinkle with the chives.